Wes and I want to share some more recipes for the veggies you received this week. First, since you’re probably up to your ears in salad by now, here are two ways that we’ve been eating it that might pique your interest. For some reason, I adore arugula most when it’s offset by a little salt, such as soy sauce. In a bowl, depending on how many servings you will be making, mix 1 part each balsamic vinegar and soy sauce to 3 parts oil. Tear or roughly cut up your arugula and mix with nuts (we use a small amount of pine nuts or walnuts), diced pieces of cheddar or Swiss cheese (or, really any you like, though feta might not taste right in this case) and some raisins. Pour the dressing over top and mix well. When we first started farming a few years ago, we joined a large crew that had one designated cook in order to simplify mealtimes. She told me this recipe that she got from her sister, who has lived in France nearly her whole life now. So simple, so scrumptious, it brings out the pleasant buttery texture of our mesclun. Dice a few garlic cloves and sprinkle generously with salt–let sit for 5 minutes. Then toss the salted garlic into a mason jar (or bowl, whichever you have) and add the juice of half a lemon (or lemon juice from a bottle is fine, too–that’s what I usually use). Pour on a healthy amount of oil. If using a mason jar, screw on a lid and shake well, or whisk well with a fork if you’re using a bowl. Taste and adjust as you like! NOTE ON SALAD DRESSINGS IN GENERAL – OIL = GOOD! We enjoy eating radishes fresh, since that crunch is oh-so satisfying and then the spice clears the mind. But, we had a pile of radishes on our table the other night, and so found a recipe to enable us to preserve them. 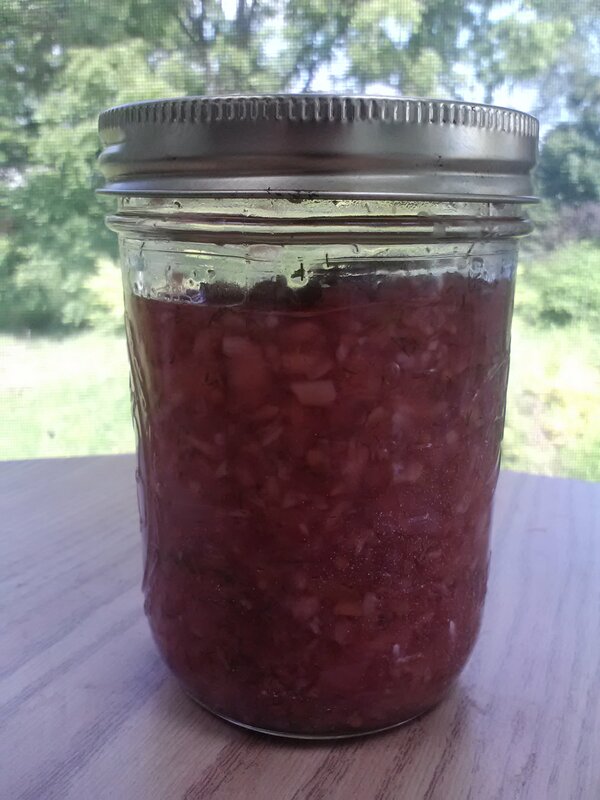 We made this awesome relish, and, dangerously armed with a large spoon, I ate half a jar right away. It is a great substitute for any other pickled relish–great in tuna salad and on hot dogs. Refreshing as a little side dish at dinner. Delicious just on crackers, a slice of cheese, a slice of kohlrabi, or on a spoon. I made this last night, and it is so crispy and fresh…I’m looking forward to eating more of it today with lunch. Disclosure: I have a food processor, which makes processes like chopping and grating very easy, so if you don’t have one and using a hand grater is too much, go ahead and dice the kohlrabis. 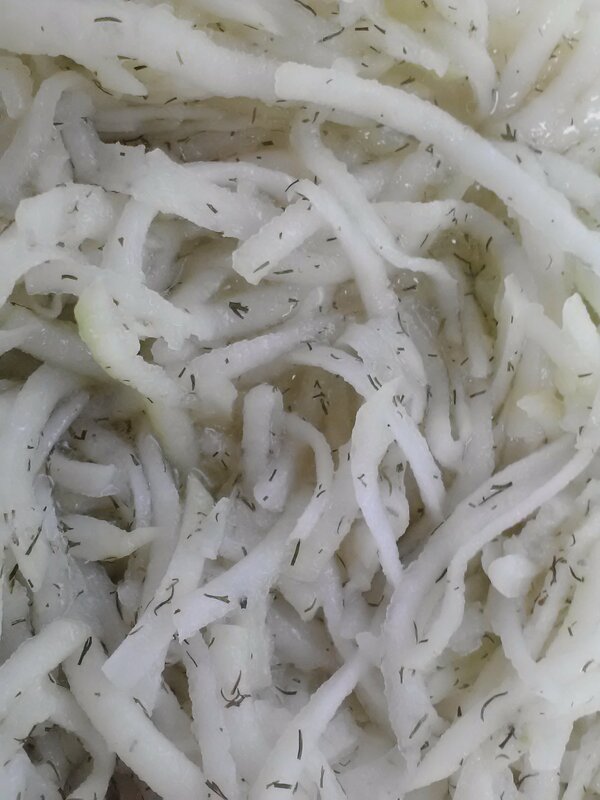 Ok, peel the kohlrabis with a knife and grate them or dice them up. Mix in a bowl with enough olive oil to coat lightly. Squeeze or squirt in lemon juice, not too much at first, since you can add more later, if you like. Sprinkle with salt and a generous amount of dill. Eat immediately or let sit in the fridge for a few hours. The dill flavor really settles in a sparkles after you let the salad sit awhile. You all got a little sack of baby beet greens this week, and perhaps you might be a little puzzled. You can eat both the greens and the root, but you will want to separate them, because the little neck between is not so easy to eat. We like to saute the greens and the smaller roots in a little butter until they wilt, and then splash with a little apple cider vinegar. You can mix the beet greens with chard or spinach for a less intensely earthy taste, if you want. We recently enjoyed veggie burgers with melted cheese and then wilted greens piled on top, eaten with a fork and knife like a little pie. We like to use beet greens in a risotto along with roasted beets. At the end of the risotto-making (use any standard recipe), when you have one ladle of broth left to add, stir in the greens. When that broth is absorbed, it’s time to add the butter and/or cheese to the risotto for one last stir. Top with room-temperature roasted beet (sliced, chunked, or diced). It all turns a lovely pink.